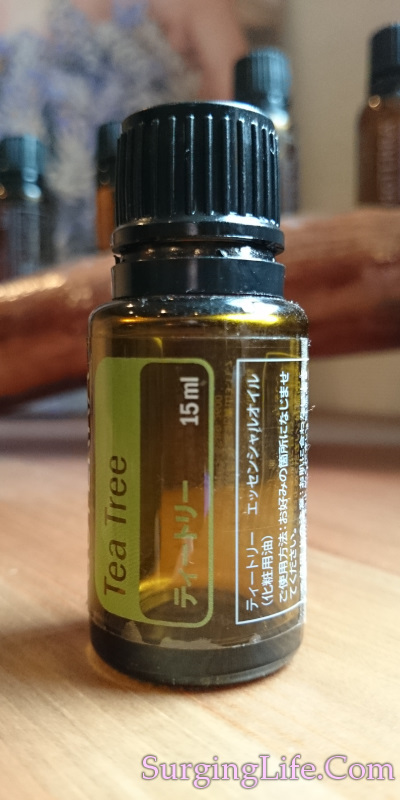 Tea Tree Oil comes from Australia. It is extracted from the leaves of the Melaleuca alternifolia, or Ti Tree, which have been used for medicinal purposes for centuries. It is commonly used for treating cuts and wounds, though its uses go far beyond. It has good tissue regeneration properties, this alongside its analgesic qualities make it helpful when treating burns, especially sunburn. Plus a strong antiviral nature, it is one of two essential oils that are effective in treating warts and verrucas. Find out more about Tea Tree Oil uses and healing benefits below. The tree itself is a native of Southeastern Queensland and Northeast coastal area of New South Wales, though is found in other places too. The species which yield the best therapeutic essential oil is Melaleuca alternifolia, which grows to around 7 meters in height, and has leaves that vary from 10 to 35 millimeters in length though are only around 1 millimeter in width. It likes moist or damp to wet areas, thriving by streams and in swampy flats. The aroma given off by the leaves is very distinct, and for many evokes a sensation of wellness and health immediately. The essential oil is extracted via steam distillation from the leaves, varies from colourless to pale yellow in colour and is clear in nature, with a thin or watery viscosity. The aroma has a middle note which is strong yet light, with a spicy tone to it. The main constituents that yield its useful properties are terpinen-4-ol which accounts for approximately 30% to 48% of the oil. Whilst y-terpinene accounts for 10% to 28% of it. The following constituents form the remainder of the composition a-pinene, b-pinene, sabinene, myrcene, a-phellandrene, a-terpinene, limonene, 1,8-cineole, p-cymene, terpinolene, linalool, and a-terpineol. If ingested in large amounts this oil can be toxic. Also if applied topically in large volumes it can cause skin irritation. Generally it is considered safe, though these oints should be considered. There are a number of species of Tea Tree which get used for their oil, there are also a lot of companies that add other chemicals to their oils to alter the composition of them, all of which affects the therapeutic value of the oil. If you wish to use Tea Tree essential oil for anything therapeutic then ensure you are using a good quality source of Melaleuca alternifolia. You will be glad of doing so as the healing results are worth it. Due to many of the claims made about its effects there have been a number of studies preformed by medical personnel around the world. Commonly they attain good findings, though in certain cases they do suggest that wider studies are performed to create a more substantial finding. Below is one such case. The Effect of Tea Tree Oil (Melaleuca alternifolia) on Wound Healing Using a Dressing Model. "Abstract Numerous studies have shown the promising antibacterial effects of Melaleuca alternifolia, or tea tree essential oil. The study detailed here replicates in humans a 2004 in vitro study that used a dressing model over Petri dishes to determine the antimicrobial effects of the fumes of tea tree essential oil. The current study used the same dressing model with patients who had wounds infected with Staphylococcus aureus. Ten participants volunteered for the quasi-experimental study, and four of the 10 were used as matched participants to compare wound healing times between conventional treatment alone and conventional treatment plus fumes of tea tree essential oil. The results demonstrated decreased healing time in all but one of the participants treated with tea tree oil. The differences between the matched participants were striking. The results of this small investigational study indicate that additional study is warranted." The Bundajalung people, indigenous to Eastern Australia, have long used the leaves medicinally for various ailments. Commonly this has included remedies such as inhalation of oils from crushed leaves to aid healing in relation to colds and coughs. Similar to the study above they also are known to apply the leaves to wounds, then apply a poultice. Skin healing applications and sore throat remedies are also known to be used, whereby they create an infusion by soaking the leaves. In certain places where large numbers of the leaves are found in ponds and small lakes the waters of them are deemed to be healing in nature. A caution is given here in that whilst infusions can be used for sore throat there is a perceived level of toxicity with the oil, so it should be used carefully. Tea Tree Oil uses in many homes around the world center mainly on the antiseptic and antibacterial properties it has. For good reason too, Tea Tree, or Ti Tree oil is exceptionally good for cleaning cuts and wounds, as well as helping to boost healing rates and immunity whilst being used. The uses go way beyond helping with cuts and wounds though. As an antiviral it helps in the treatment of a wide range of viral issues, including Herpes and Tonsillitis, as well as the often difficult to treat Warts and Verrucas. On top of this its antifungal properties help with conditions such as Athletes foot. It is remarkable in that it has Antibacterial, Antifungal, Anti-Inflammatory, Antimicrobial, Antiparasitic, Antiseptic and Antiviral therapeutic properties. It truly is great for helping you to heal and ward off infection on a physical level. Whilst the antiseptic and antibacterial properties may be a big draw for many people who desire a natural way of cleansing wounds and cuts, the tissue regenerator property is also incredibly beneficial. By treating damaged or dis-eased areas with Ti Tree oil you actually boost your body's ability to heal the tissues concerned. It helps to actually recreate healthy tissue and bring you back into the proper state of health that you desire. It is one of the few essential oils that has this wonderful property. Whilst open cuts and wounds are widely treated with this oil, it is also good for other conditions, especially viral conditions such as the Flu, Herpes and many more. In terms of Warts and Verrucas it is one of two essential oils that are recommended for clearing them, and is very good for that purpose. When used in conjunction with sunburn Ti Tree oil helps to take away the sting via its analgesic property, whilst also helping to promote freshening of the skin via its ability to regenerate tissue. For acne and oily skin it helps to clear away excess oil, cleanse the pores and its antibacterial properties help cleanse infections and prevent them from spreading. Something that is well worth noting is that having massage therapy with Tea Tree oil prior to surgical procedures helps to strengthen the immune system and fortify the body, as such helping to reduce the possibility of post-operative shock. The ability of Ti Tree oil to heal the body is really quite remarkable and it is definitely an essential oil worth keeping at home and at work for the various things it can aid with. For the best results in terms of all Tea Tree Oil uses it is worth using a high quality source. You can find a high quality source of essential oils here, and more on other essential oils here.